After a few years of NOT having a specialised art quilt competition (I think there was a lot of grumbling at the first competition) The Festival of Quilts in the UK has another art quilt competition. Have a look at the finalists. I particularly enjoy the story telling in this piece by Laura Kemshall – In and Out of Love. 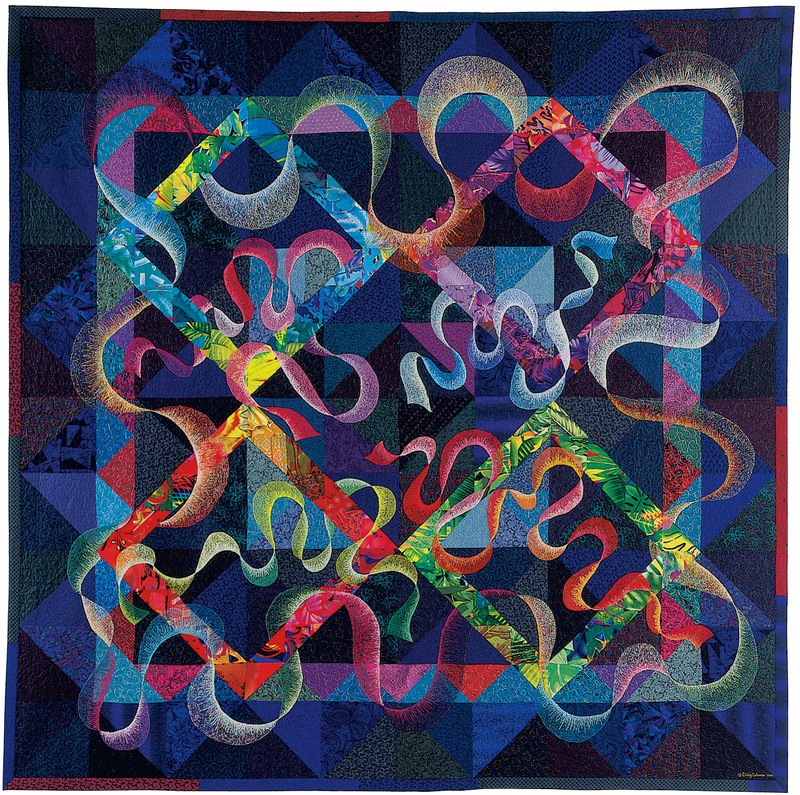 It’s weird – I’m known for not liking realistic or photo transfer quilts but this absolutely draws me in. I think the content is so meaningful, the imagery so beautifully presented and somehow one feels the push, pull of a relationship in the way the portraits are layered, they are looking forward, away and towards each other. This image will probably stay with me for a long time. When I lived in Florida I was part of a beading group which met every Thursday. It was my first experience working with beads – and being with others who beaded and shared their talent. Jerri Heer, along with all the other amazing work she produces, teaches how to make gemstone trees. I bought one of her smaller kits to try my hand. I chose gold wire and amethyst gemstones. The package was a brilliant surprise – it contained just about everything I needed to make the gemstone tree, including a twisting tool, toothpicks, wire, gemstones and a lovely stone base. The only thing I had to supply was patience, and glue! This encourages me to continue on and make a larger gemstone tree for a complicated piece I am working on……. If you would like to make your own tree, Jerri Heer not only has the kit but she has an excellent tutorial video available for free on her Etsy site Nature’s Arts. The professional group I’ve belonged to for 20 years or so has produced a video about the association. This film includes member interviews PLUS beautiful artwork. Find out more about SAQA’s history and how the members get inspired to create. Every year the Portland Bead Society holds a retreat. Usually at Cannon Beach in Oregon. We also have a bead challenge. Last year I entered my Orange You Blue necklace. This year I entered a piece I like so much I’m going to work on it some more and you’ll just have to wait until it’s finished before I put it online (PS. I did win second place!). Here are a couple of beaded goodies I particularly liked. And if you would like to see more you can go to the Portland Bead Society Artists page and have an idea of what we get up to. I particularly like this rabbit necklace by Anna Chase. It’s very subtle and needs looking at. She made the brown shaded polymer beads herself.